Asteroid 2012 TC4 is on its way to whizz seriously close to our planet for the second time after the space rock barely missed Earth in October 2012. Astronomers estimate 2012 TC4 could be as big as 40m wide - just under the height of New York's well-known Statue of Liberty from her feet to the tip of the torch. This is double the size of the meteor that detonated over the Russian city of Chelyabinsk in February 2013, which wounded 1,500 people and smashed more than 7,000 buildings. The effect of the larger 2012 TC4 asteroid, expected to near Earth on October 12 2017, could be even more overwhelming. And, disturbingly, researchers cannot yet forecast where in the world it will strike. Dr Judit Györgyey-Ries, astronomer at the University of Texas' McDonald Observatory, spoke to space blog astrowatch.net: "We could see an airburst maybe broken windows, depending on where it hits." 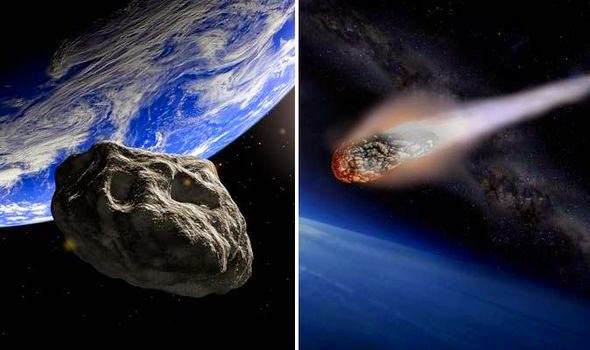 The huge asteroid was discovered on October 4, 2012 by a Hawaiian observatory and a week later barely missed Earth when it passed 94,800km away. Detlef Koschny, head of the near-earth object section at the European Space Agency, said: "There is a one in a million chance that it could hit us.”The size was estimated from the intensity, but we are not familiar with its reflectivity. So it could be smaller or larger, assume from 10 to 40 metres. "A 40m iron object would go through the atmosphere and make a crater; a 10m rocky object would hardly be noticed." NASA's Asteroid Watch said there is no chance the asteroid 2012 TC4 will hit Earth, but Dr Györgyey-Ries said more observations are required to lessen the doubts.